That is no longer the case, especially as viewers strive for a more immersive audio experience. Along with improved picture quality, the audio needs as much attention. Viewers are accustomed to DVD-quality audio and broadcasters must strive to match it. In the case of television stations, loudness is a matter of FCC regulations. And when it comes to monitoring audio, the choices are speakers and headphones. Most engineers understand what is required of speakers, but what about headphones? Do you know how to pick a best pair for an application? We can help. Today it takes sophisticated equipment just to properly display loudness according to the FCC's regulations. Image courtesy TC Electronic. 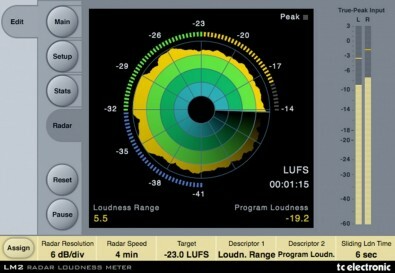 Audio loudness, or the difference between program-level audio and the commercials eventually caused TV broadcasters a real headache. Because commercials were often highly compressed they sounded louder than the TV programs and viewers complained. In fact, a dinner guest in the home of California Representative Anna Eshoo was so angry about the levels, he asked her to do something about it. That caused her to launch a one-woman petition to the FCC, which was forced to reign in TV audio loudness. Another result was that an entire range of new audio test and measurement equipment was developed to monitor loudness. Click here to better understand key issues and where to look for answers. Headphones continue to be an important tool for accurate audio monitoring. Out of the dozens of brands and types of headphones on the market today, how does an audio producer — who wants to monitor “accurate” sound — select the best model for professional use? For professional sound monitoring purposes — both live and in the studio — the most frequently used headphones are the full-sized, over-ear models, which provide excellent bass response, sound clarity and good isolation from outside noise. The extra padding makes these headphones comfortable to wear, but they are larger than phones made for portable stereo applications. Want to know more about selecting headphones and view a list of possible models and prices? Click on the link below to learn more. Visit The Broadcast Bridge daily for more answers to your technology questions.